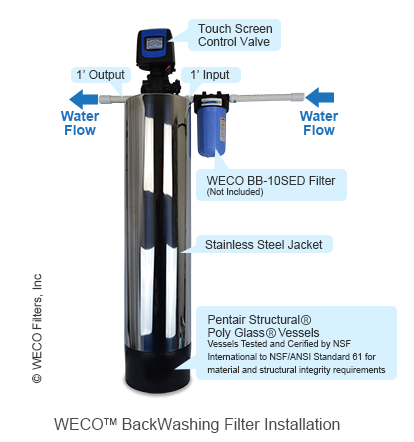 The WECO Backwashing filter with catalytic granular activated carbon (GAC) plus a KDF-85 Media Guard is a high-performance Point-Of-Entry (POE) filter designed to remove rotten egg odors caused by hydrogen sulfide from water supplies. Ferrous iron along with potentially harmful metals such as zinc, cadmium and copper are oxidized and rendered non-reactive by catalytic reactions. Incoming water first passes through the Media Guard with KDF-85. Media Guard is an insert device loaded with KDF-85. The device fits inside a regular backwashing filter through which the water passes before contacting the high-porosity activated carbon contained in the filter tank. This prolongs the life of the activated carbon and increases the efficiency of the filtration system. The KDF-85 catalytic media consists of high purity copper-zinc granules that use redox (the exchange of electrons) remove hydrogen sulfide, heavy metals, chlorine and control microorganisms in potable water without the use of chemicals. Residual chlorine disinfectants then react with the tank of GAC, converting chlorine to harmless chloride. Hydrogen sulfide (H2S) is responsible for noxious “rotten egg” odors in bath water, showers and drinking water. The odor may be noticeable only when the water is initially turned on or when hot water is run. Heat forces the gas into the air which may cause the odor to be especially offensive in a shower. Hydrogen sulfide is corrosive to metals such as iron, steel, copper and brass. It can tarnish silverware and discolor copper and brass. Hydrogen sulfide creates yellow or black stains on kitchen and bathroom faucets. Coffee, tea and other beverages made with water containing hydrogen sulfide may be discolored. Prepare foods’ appearance and taste are affected by H2S in water. Ferrous iron is invisible in water until it reacts with oxygen and precipitates as ferric iron particles. Iron can foul water softeners and other ion-exchange resin filtration systems. Iron will also reduce the efficiency of reverse osmosis filtration systems. Iron gives hair orange-tinted highlights and interferes with coloring products. Iron particles clog shower heads and faucet aerators. Iron is known to foul and damage water-using industrial and medical equipment. Copper can cause hair to have a greenish tint that causes hair coloring products to look too dark. Blue stains in bath tubs, sinks and toilets are caused by copper. This system also removes natural and synthetic organic compounds that cause musty odors and tastes. Carcinogenic industrial chemicals like solvents, MTBE from leaking fuel tanks and other health hazards are absorbed by the activated carbon. Water enters the top of the tank through the Fleck control valve and passes downward through the KDF-85 Media Guard then through the bed of granular activated carbon. 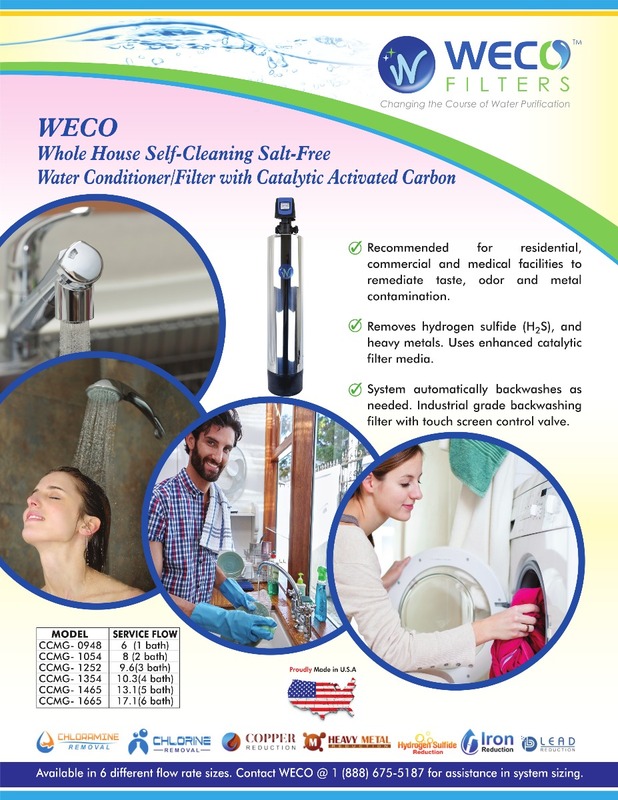 The WECO backwashing filter will clean itself periodically by rinsing away particulates that may have collected in the activated carbon bed. The Fleck control valve automatically starts the backwash process. The backwash procedure is an operation where water passes backward through the filter media at a fast flow rate. It enters the tank at the bottom through the riser tube, then flows upward through the filter medium, exiting at the control valve and sent to waste. The rapid, turbulent upward water flow, in addition to flushing away particulate matter, loosens and resettles the media bed, preparing it for another filtration cycle. The treated and conditioned water enters the riser tube at the bottom of the tank, passing upward and exiting the filter through the control valve.